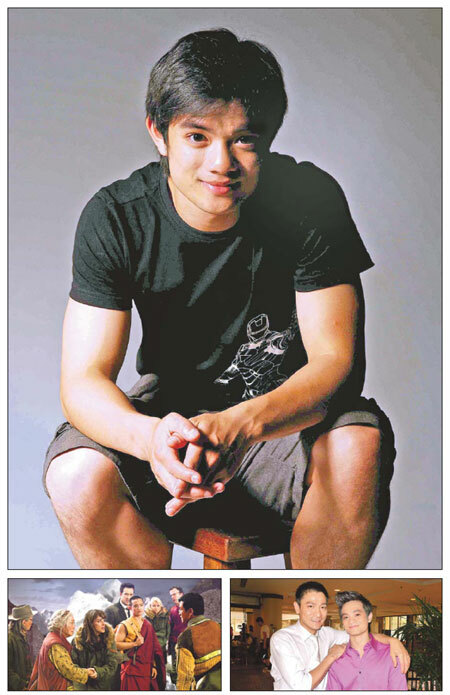 Osric Chau may not be a name you recognize, but that may change in the next 12 months. Chau is originally from Vancouver and at 24 is at the beginning of his acting career. "I've been doing acting since I was about 8, but only really became a full-time actor in the last few years," said Chau. Despite only being a newcomer to the scene, he has already acted alongside John Cusack, Daryl Hannah, Andy Lau, Gong Li and the late David Carradine. It has been a quick rise to prominence for Chau since coming to Beijing. Although he only came to China to study Mandarin and look for roles in 2009, he had previous experience in China. As a canadian-born Asian with experience in the Canadian wushu team, Chau got his first big break in the two-part TV movie Kungfu Killer. It was in this movie shot in Hengdian, Zhejiang province, that he worked with Carradine and Hannah and got a chance to show off his martial arts skills. "I had trained to be a stunt man, so when it came to the action scenes I was involved a lot," he said. Although the movie itself was panned, reviewers praised Chau for his excellent fight scenes and screen presence. Despite this break, gaining further roles was difficult for an actor of Asian origin who couldn't speak Mandarin. However, it was his gamble at speaking Mandarin in an audition for a part in blockbuster 2012 that really moved his career forward. "They told me I could do the lines in English, Cantonese or Mandarin. As the character was likely to be Chinese, I knew it would be a major advantage to use Mandarin. I didn't really speak Mandarin but practiced and performed the lines in Mandarin anyway, which put me on the shortlist. In the fourth audition, producer Roland Emmerich was in the room and liked it, so I got the part," said Chau. The film's success in China convinced him that this was the place to be if he wanted to further his acting career. Certainly, there are those who might say that coming here is the easy way out compared to fighting it out with other big stars in Hollywood, but Chau doesn't see it that way. He believes that there aren't many great parts outside of the stereotypes for Asians in Hollywood, and with so many co-productions here, it seems that Hollywood is already coming to China. "I knew this was the place to be. Also, as a Canadian I have no real way to get a long-term working visa in the US without gaining a significant part first, so things are more flexible for me here." The decision to live in Beijing has certainly helped his career, as he recently wrapped up filming in the Chinese remake of What Women Want, alongside Chinese megastars Andy Lau and Gong Li. "I got the part after meeting the casting director on an evening out. That would never happen in the US, but here it is possible. It was amazing to work with such huge stars like Andy Lau," he said enthusiastically. The movie is due out on Valentine's Day 2011 and Chau hopes it will lead to even more roles both here and abroad. "I have done different types of movies and although I always grew up wanting to act in action movies like Jackie Chan or Jean-Claude Van Damme, I know I want to continue to do varied work." Chau said his dream is to play "any role that is not typically cast for Asians", and that he believes "perseverance is the key to success as an actor. I've had my difficulties, but if you work hard, you can make it". Although it's too early to tell how far Chau will go, his attitude and already impressive CV suggest he could be one to watch in the coming years.